Yume to iro de dekite iru; its official store bonus is sound track flash drive. Also voice drama. Holy crap (see below). New Jiku-Chu tapestry illustrated by Shino. Fancy. Announcement of ASa Project new title announcement. Citrus (not Navel) first title is delayed to April. H-scene with Kotori in latest Riddle Joker manga. A sign for FD? Also where’s the next Yuzusoft title? More Anmi eromanga magazine cover. Also I missed the Comic Kairakuten Fes last year which was selling Anmi lewd (almost R18) B1 tapestry. Per-frame DRM lol. Kingdom Hearts 3 render fail. Also I thought it’s real time render. But it’s not. Not that I care much as I don’t play any of the series. How to IME. Interestingly Windows’ later IME has some exceptions for English words and brands and perhaps others. Lol rip 7k. Sakura, moyu store bonus CDs. Slightly on expensive side but not too much. Various doujinshi from last CT33 and C95. That last one is too bad not R18. Continuing the CD above, I got the full game as well. Apparently it’s good? Not sure when I’ll get around playing it though. 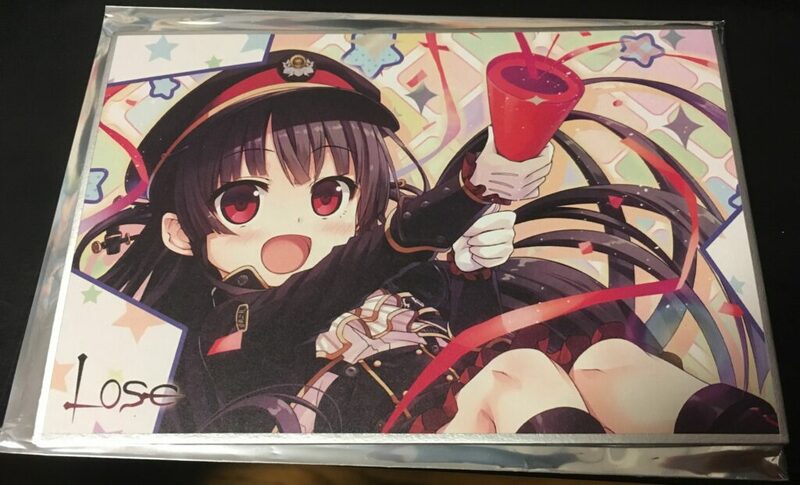 Yet another Maitetsu/Lose postcard-sized shikishi. At least it’s new. And lastly tapestry bonus of the Sakura, moyu game above, from Amazon. As mentioned before, I don’t quite like the coloring and this one is actually the second on my initial list with the first one, Tora no ana, sold out already. Usual thin material with okay print. Need ironing because it’s not preassembled. Not sure if will keep because the colors. At least the composition is nice with sakura and sky and mysterious liquid and stuff. Oh and the ever-important white knee-socks. Not sure if I can make good progress this week either as there are some movies I want to watch. I forgot to mention last week I finished Doom episode 2 (The Shores of Hell). I should continue to episode 3 sometime. I went in a bit but the second map is a bit annoying. Only grinding and challenge quest remaining for my FGO valentine event progress. It should be fine with almost one full week available. Lastly as mentioned above, there are several movies on my list for this month. First is the latest Code Geass though I need to watch the first two to refresh my memory. Then there’s the second and third Psycho-Pass movie. The first one was good though not enough Akane. Usual Psycho-Pass stuff. Second one is coming this weekend and the last one next month. Not anime but I’m also curious a bit about First Man. Only several months late here in Japan. More on not-anime, apparently there are more DCEU thingy, Aquaman. I’m so behind on this but I guess I should just watch whatever I can at this point? And here’s the thing caused quite a big damage to my finance this week. It started with me figuring out I should just get a pair of 1 TB drive so I can run my dev DB on it and then the extra 500 GB can go to my home gateway since it’s almost full. Everything is done and my development system runs much faster with plenty of space and so does my gateway. Well, with almost 30k hole in my finance. Later last weekend I also finally gotten around updating my portable backup drive (which has started dying months ago) but then learned my main data has exceeded its 640 GB storage. Whoops. So I got a new 2 TB portable drive which costed me another 10k. So, with that 40k above and Sakura, moyu purchases totaling at 20k I did unplanned 60k spending. Would be nice if that’s all but then I also ended up getting feng’s Yumeiro. Lol. That’s another unplanned 30k. RIP me. That said, I don’t know what I’ll put up yet. Oh well, I’ll figure out something. The same for pillow covers. All said and done, I still have some buffer remaining which hopefully will be enough for upcoming events. …is what I thought then I remembered about flight ticket. Nooooooo. On eroge, current list include Alcot’s Shogun FD (questionable), Palette’s 9-Haruiro (preordered), Parasol’s Senran (questionable). Really not sure about Shogun FD. Not even the first one. I still want to play at least Nakahito but really not sure about the rest of Alcot, especially the ones without Nimura Yuuji. The same applies to Parasol now I think about it. Ichiri and Sakura Hanpen are nice but I think I’ve had enough with Quintuple Splash. …I’ll figure them out later. Almost 4. And I need to wake up early tomorrow. Or maybe not because it’s almost 4 and I’ve been having lack of sleep recently. Maybe will continue Tearstilla a bit and then sleep. …ha ha ha “almost 4”.